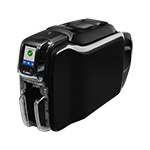 The ZC350 card printer comes loaded with an array of time-saving, flexible features, including some amazing new things you can do with Zebra's latest card printer ribbons. Three new ribbons are available for the ZC350 that enable specialty printing features not typically found in ribbon-based card printers. In this article, we'll look at the difference between standard ribbons and the ZC350's specialty ribbons and then we'll dive into the details of each of the specialty ribbons. Standard color ribbons are multi-paneled, with dye, resin, and clear panels. The 3 color dye panels of the ribbon - yellow, magenta and cyan - combine to create the colors you see on printed cards. In addition to the color panels, there is a black resin panel for printing monochrome black text, images and barcodes, and a clear panel that protects the finished card with a varnish layer. Zebra's long-life ribbon adds four times the durability of a standard ribbon, without the complexity and cost of lamination. It adds two protective layers to each card, so you get much greater durability, even with a smaller, compact card printer such as Zebra's ZC350. The dual protective layers also allow you to add a watermark to the protective layers that is visible at an angle. This can be text or an image that can be checked for authenticity. The watermark fluoresces under a UV lamp, making it easy to verify genuine cards. This combination of enhanced security, four times the durability, and simpler printing process makes Zebra's long-life ribbon a perfect option for on-demand printing of long-lasting ID cards for schools, airport security, government access, and more. Zebra's color-shifting ribbon allows you to print cards with pearlescent text and images that shift from pink to green as you rotate the card. This adds further security to cards and makes them unique and extremely difficult to counterfeit. The color-shifting ribbon also adds a protective overlay over the pearlescent print layer, to provide final protection for all card layers. You can add these features quickly, easily, and at a lower cost, thanks to the ribbon's capabilities and the ZC350 printer's simplified card production process and small footprint. Zebra's new 3D ribbon adds a metallic silver layer to the card to create 3D visual effects, without having to change ribbons. It creates a base layer of metallic text or images, adds a dye receptive layer, a standard color layer, and finally a protective overlay. The ribbon creates unique 3D visual effects that make each card stand out and allows you to highlight certain features such as a company logo. It's all possible by simply combining the 3D ribbon with Zebra's ZC350 printer to get advanced capabilities without having to invest in a much larger or more complicated and expensive device. CardStudio is Zebra's design and issuance software. It allows you to design cards, link your design to one or more databases and add variable data such as name, title, department, etc. Zebra recently launched CardStudio 2.0 software, an updated version of the software. One of the unique features of CardStudio 2.0 is that you can design the specialty layers and incorporate it into your standard design. All of this makes the ZC350 and its three new ribbons a game-changing revolution in affordable, compact card printing.